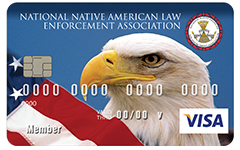 The Official Card of the FBI National Academy Associates, Inc. 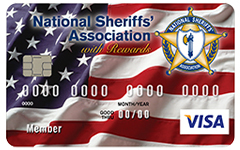 The Official Card of the Society of Former Special Agents of the FBI, Inc.
*APR = Annual Percentage Rate. Offer as of April 1, 2019. Subject to credit approval. If you have not previously received a credit card from us: An introductory rate will apply for the six-month period immediately following the date your account is established. VISA's Zero Liability Policy does not apply to ATM transactions, or to PIN transactions not processed by VISA, or if you were grossly negligent or fraudulent in the handling of your card. Proof of reasonable income required. Credit card subject to the following: Cash advance fee, convenience check fee: either 2.00% of the advance or $10 whichever is greater ($50 maximum), Foreign transaction fees: 1.00% of each foreign currency transaction in U.S. dollars or 1.00% of each U.S. Dollar transaction that occurs in a foreign country. Credit cards have no annual fee, balance transfer fee or transaction fee.